A beautifully presented salad is a many splendoured thing. It enchants the eye and tantalizes the taste buds. Crisp, green leaves are a vital part of our menu, especially during starch driven winter days. Our lives are so hectic that many of us use pre-packaged washed salad leaves. Half a salad all at once! Quick, easy and practical! BUT...what lies behind these pristine leaves in their puffed out plastic cocoons? We need to know more. Join Back Chat as we investigate. We will follow the trail and learn more about the salad leaves some of us take so much for granted. If you have your doubts about anything or would just like to know more, please email me at les@leslieback.co.za or leave a comment on the blog. Remember Back Chat is on the case. 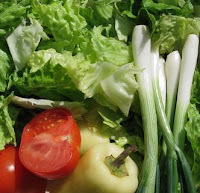 The different varieties of lettuce, eaten raw, are one of our most valuable fast foods. Low calorie, vitamin rich and cholesterol free. For many, an indispensable part of our everyday eating. They have a large organic water content varying from 92-95% and contain an abundance of potassium, calcium, magnesium, iron and vitamins A and C. In addition, they are rich in essential elements, silicon and fluorine. Nearly all the vitamins we need are found in lettuce. Raw they are nourishing foods for cells and tissues of the nervous and muscular structures of the body. Don’t discard the outer leaves as they contain the most vital nourishing elements. Darker leaves have the most nutrients and interestingly one of the valuable aspects of lettuce is the strong effect in stimulating the metabolism. Cos lettuce or Romaine as it is also known it the most nutritious of all lettuces and has five times more vitamin C than iceberg lettuce. Quick, easy, washed and ready to eat. Farmers that grow salad leaves are chosen regionally where possible and are continually audited by the groups that they supply. Very stringent hygiene procedures are observed from growing, harvesting through to packaging. Spraying and harvesting are government regulated and the auditing is continuous to maintain international standards. When crops are sprayed, it is prescribed how long before harvesting spraying must be stopped. Once harvested, the lettuces are washed, then a cooling down process takes place. At this time painstaking testing takes place to make sure that there are no chemical residues. Testing is random and continual. Sorting and grading takes place next and again more washing. The salad leaves are then spun dried and the temperature reduced. At this stage the leaves are washed again, this time for dust, not pesticides as these have previously been carefully and thoroughly removed. The specifically formulated plastic bags are filled with leaves and flushed with modified air to further extend shelf life. The actual packing facilities are checked and the handling carefully monitored. Refrigerated, the leaves will be at their best between 1 - 2 days. It would be wise however, to wash the packaged leaves when one buys from a source that is less well known. This is despite the fact that the package indicates that the leaves are washed and ready to use. When buying whole heads of lettuce, there are a few basic rules for storage and handling. Remove the outer leaves, when damaged. Carefully remove individual leaves. Wash thoroughly in more than one change of water and spin dry (the best way). Wet lettuce becomes soggy when stored. Refrigerate lettuce in a loose plastic bag, properly sealed. This way the leaves can last from 3 – 5 days. There are countless varieties of lettuce throughout the world and because they peak at different times of the year, we can always enjoy some variety of lettuce or mesclun (a mixture of loose salad leaves). Convert the mumbling rabbit food brigade with great salads and wonderful dressings. Never use a knife when you prepare lettuce or any salad leaf, if possible. Cutting tends to brown the edges of the leaves. Breaking up the leaves too soon can cause them to go limp quickly. Leave the leaves whole if possible until you are ready to serve the salad. Even then, with immaculately washed hands, tear the leaves rather than use a knife. 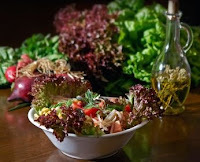 Although the key ingredient in any salad is usually the lettuce, there are many fragrant salad leaves i.e. Rocket, watercress, baby spinach leaves and others. The Americans know Rocket (English name) as Aragula. In Italy as Rokka and often it is described on menus as rucola or rugola. Whatever name, it is the same basic leaf, one with great character, a hazelnut peppery taste and with its strong flavour goes a long way and can be used singularly or tossed with other leaves making a salad that has a slight bite. Many of us grew up on this salad leaf, large crisp leaves and a sweet and slightly watery flavour. Its rather eccentric name is derived from the fact that the lettuce was transported in iceboxes on North American Railways. Apart from using for salads, the leaf is often used whole as wrappers in Asian dishes and in Vietnamese spring rolls. 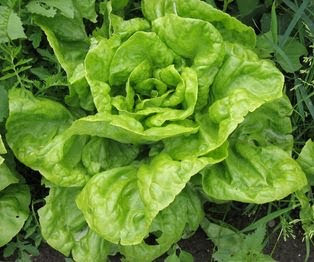 This is an attractive light green lettuce with soft round leaves and a mild buttery flavour. Very much in favour in France. Children and people who ‘don’t like lettuce’ prefer it. There is a mignonette variety that has brownish red leaves. This has crisp long leaves that are tightly wrapped to form an elongated head. A tight head lettuce eaten extensively in the States. Crisp, succulent and sweet, most people find it a delicious salad ingredient, essential for Caesar salad. This lettuce has tightly curled, crisp leaves. There are red and green varieties with a subtle bitter flavour that goes well with seafood. Much like coral lettuce, with leaves of a pretty oak-leaf shape. The flavour is milder than coral lettuce. It also has red and green varieties. This lettuce is a member of the chicory family. It is dark red and its leaves have a bitter taste. A little in a salad is all that is necessary. Chop just a small amount and add to a salad for a bittersweet flavour. It can be served warm by grilling or frying. This is delightful in a salad. You may not react like Popeye, but it is healthy and full of vitamins and minerals. This is one of the most valuable of our leafy vegetables. The juice of this vegetable is one of the most nourishing for the entire digestive process. Spinach must be very carefully and thoroughly washed. Savoy with crinkly curly leaves and a dark green colour. Flat or smooth leaf has unwrinkled spade shaped leaves and is generally used in cans and frozen spinach as well as in soups and baby foods. Semi Savoy This variety has slightly crinkled leaves. It has the texture of Savoy, but not as difficult to clean. 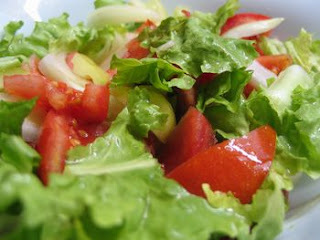 This is an example of a salad leaf that lives happily with or without lettuce. There is confusion about the names, endive and chicory. The reason is that the plants are very closely related. In England, endive means the curly headed salad plant generally called chicory in the United States. Chicory in England is what the French and Americans call endive or Belgian endive. The Belgian endive is blanched. This means it is grown in the dark so that the leaves are silvery white at the base and yellow at the top. It has many values. The bulb, which is the edible part, consists of 90% water. It is a good diuretic. Great in salads. They belong to the same family as onions, leeks and garlic . Chives grow in clumps and the stems are firm, straight and smooth and like the leaves, are a bright dark green. The flowers, which bloom in midsummer, are deep purple and look wonderful tossed across a salad. It is easier to snip chives than to cut them with a knife. They give a hint of onion flavour to egg dishes, cheese soufflés, salads, soups or wherever your fancy takes you. Garlic chives are a wonderful surprise in a salad. They contain more than 80% water; are fairly high in potassium, calcium, phosphorus and sulphur. 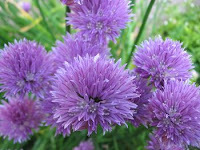 Chives are stimulating to the digestive system, valuable as a blood cleaner and have a strong diuretic action. Anybody with kidney problems should use them in moderation. This is a lemony slightly pointed leaf. Use young with other salad leaves or with juicy melons, pears or roasted peppers. Mature leaves are delicious in soups and sauces, giving a distinctive citrus tang. Their sharpness brings out the sweetness in delicate meats such as chicken and adds lustre to salmon. Alternatively use sorrel with eggs in creamy dishes. Note that sorrel will turn a dull khaki when cooked and, even when adding at the last minute, hardly retains its colour. In terms of flavour, watercress gives rocket a run for its money. It asserts itself in salads and partners well with creamy or rich ingredients such as blue cheese or salty hams. It has small soft leaves that wilt quickly. Choose glossy fleshy leaves and stems without a hint of droopiness. Wash well and eat in large quantities, not merely as a garnish. Watercress is one of our foods richest in sulphur. It is not organic and is found in streams and brooks and therefore needs thorough washing, however most often we buy it commercially grown. Rich in potassium, calcium, sodium, magnesium, phosphorous and chlorine, it has water content in excess of 92%. Store watercress in the refrigerator with the stems in water and the leaves loosely covered in a plastic bag. This is one of the most potent foods of the common vegetable kingdom. It stimulates the secretion of digestive juices and helps considerably in disturbances of the liver and spleen. It has water content in excess of 85%. Parsley is rich in potassium, calcium, magnesium and chlorine. This plant has small leaves with a distinctive liquorish taste. The use of these leaves are always a matter of taste as some love the flavour and others prefer to leave it out. The bulb, which is the edible part, is 90% water and also a good diuretic. It has high sodium content and is rich in potassium and iron. 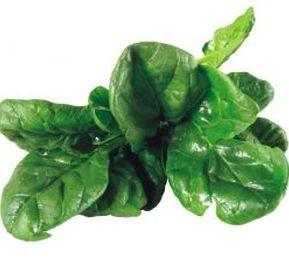 Lovely green basil has a sweet aromatic smell and is extremely subtle. Ideal for salads. Dill has dark green leaves with a definite taste, which reminds one of aniseed. Besides being a salad accessory, it is ideal as a pickling aid and lovely with fish and sauces. Choose only the freshest and finest ingredients and build a solid foundation. Make your own signature salad dressing and when you dress remember less is more and toss the leaves thoroughly to coat each one. Let colour and flavour be your guide. Finally, serve slightly chilled on large plates. Very interesting, thank you. Poodles also like salad. Experimenting at home we've found millet and wheat seedlings and any type of parsley to be perfect to eat after kibbles! Hey all you dog lovers - take a leaf out of Babette or Mia Poodle's cookbook. Great idea to spruce up the kibbles and make the food more interesting.